The turkey may be the star of your holiday table, but without the sides and pies, Thanksgiving wouldn’t be Thanksgiving. If you’re open to trying some new dishes this year in addition to those family favorites, consider these make-ahead recipes. A quick warm-up before serving is all that’s needed. 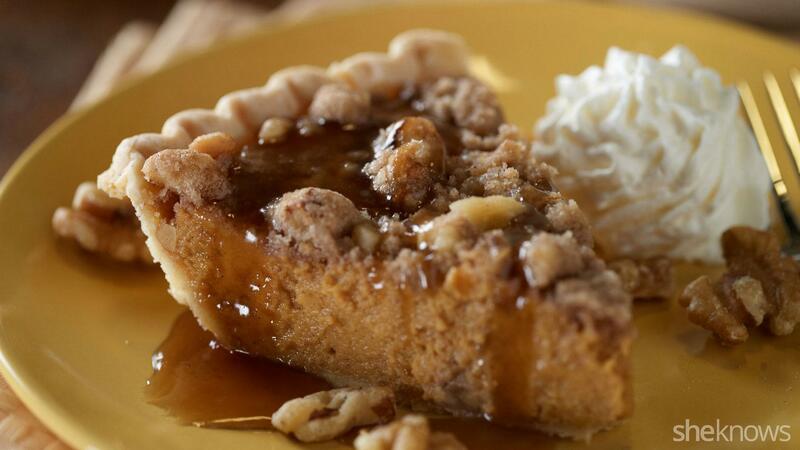 t I added a sweet, crumbly streusel topping to a classic sweet potato pie. It’s truly decadent when served with the maple glaze. Quickly make the glaze while friends and loved ones clean up the dinner table. With any luck, you won’t have to wash a single dish. lace sweet potatoes, brown sugar, maple syrup, evaporated milk, spices and vanilla in a food processor. Cover and process until smooth. Add the egg and process until incorporated. Pour the filling into the pie crust and place the pie on a cookie sheet. Bake for 20 minutes. While the pie is baking, make the streusel topping. Combine the brown sugar, flour, butter, cinnamon and walnuts in a small bowl. Remove the pie from the oven after 20 minutes and add the crumbled topping. Bake the pie for another 20 minutes and then let the pie cool completely. Just before serving, make the glaze. Melt the butter in a small saucepan and then stir in the brown sugar until dissolved. Stir in the maple syrup. Serve the sauce warm, drizzled over slices of the pie. t Cheesy risotto and savory bacon soften the bitterness in these collards, making this dish a flavorful, universal favorite. Because you need the leaves to stay whole for rolling, don’t remove the entire center stalk, which is normally recommended when preparing collards. Instead, just cut off each stem where it meets the leaf. Cook bacon over medium heat until it begins to crisp in a 4-quart saute pan. Add the rice and cook another minute. Ladle in 1/3 of the hot stock, bring the mixture to a simmer and continuously stir until the stock is absorbed. Repeat with remaining stock. Stir in Parmesan, butter, thyme, salt and pepper. Spread the risotto out on a baking sheet and refrigerate until chilled, about 30 minutes. While the risotto is chilling, bring a large pot of water to a boil. Add half of the collards to the pot and cook for 1 minute. Remove the greens from the pot with tongs and place them into a dry bowl. Repeat with the remaining collards. Combine all of the sauce ingredients in a separate bowl. Spread about 1/3 of the sauce on the bottom of a deep 9 x 13-inch baking dish. Preheat the oven to 375 degrees F. Working with one collard leaf at a time (or if small, 2 leaves overlapped) place about 1/4 cup of the risotto in the center of a leaf. Fold up the base of the leaf over the filling, fold in the edges and roll it up tightly. Place the roll seam-side-down in the baking dish. Repeat with the remaining leaves and risotto. Spoon the remaining sauce over the rolls and cover and bake for 1 hour. t This is classic Americana with holiday flair. I’ve always wondered how to make a lattice crust and was surprised by how easy it really is. Just take your time… you can do it. The end result is truly worth it. Position an oven rack on the lower level and preheat to 425 degrees F.
Place 1 pie crust in a lightly greased 9-inch pie plate. Press firmly against sides and bottom. Place the orange zest, butter and both sugars in a large mixing bowl. Add the flour, cinnamon, nutmeg and salt and mix until evenly incorporated. Add the sliced apples and cranberries into the bowl and gently toss until all the apples are evenly coated. Spoon the mixture into the crust-lined pie plate, tightly packing and mounding the apples slightly. Brush the egg wash along the pie crust. Form the lattice crust (method follows) and press to seal it to the pie crust, trimming any excess dough. Brush the egg wash all over the lattice dough and around the edges. Sprinkle the Turbinado sugar over the top of the pie and bake for 20 minutes. Reduce the oven temperature to 375 degrees F. Cover the edge of the crust with 2-inch wide strips of foil to prevent excessive browning and continue baking for 40 – 50 minutes, or until the apples are fork tender. Cool on a wire rack at least 2 hours before serving. Place the round store-bought dough onto a lightly floured surface. Lightly flour your hands and smooth the dough surface with a circular motion. Cut the dough into 3/4 inch thick strips. Place vertical strips of dough over the filling, spaced evenly, across the pie. Use longer strips for the center and shorter strips for the edges. Allow a little of the ends to hang over both sides of the crust. Starting with the strip on your left, lift up and fold the dough back halfway. Repeat with every other strip. Place a strip of dough horizontally across the center of the pie. Return the folded strips to their original position so they cross over the horizontal strip. Place a second horizontal strip, evenly spaced, below the first horizontal strip. Return the folded strips to their original position. Repeat the process until you have covered the bottom half of the pie. Then, turn the pie around and repeat with the other half. tDavid Venable is the program host of QVC‘s popular cooking and dining show In the Kitchen with David. He offers a diverse and unique viewership experience with features such as product information, cooking demonstrations, on-air guests, celebrity appearances and live viewer interaction. Follow him on Twitter and Facebook.